Yesterday, high up in the Indian Himalayas, the Ladakh Marathon took place. 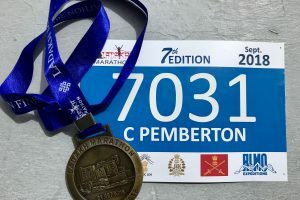 Leh, the capital of Ladakh, is at 3,500 metres altitude so the whole focus of this race (well for me, at least) was all about acclimatising for the reduced oxygen levels. I’d originally signed up to run a full marathon in Leh, but wiser counsel prevailed, so I switched to the half. Instead of being stressed at the lack of miles I was not putting in, in Delhi’s hot and rainy and humid summer, I relaxed & enjoyed the whole experience. But, since I’d already booked flights on the basis I was running a full, I still went up to Leh early, as originally planned, and had nearly a fortnight in one of my most favourite places ever. So I suppose I was reasonably well acclimatised, even though I still huffed and puffed alarmingly. But no headaches, no nausea, no discomfort – just breathlessness frst thing in the morning, when I’d set out to run to Shanti Stupa with a lovely young runner, Shipra Yadav, who was staying in the same hotel. Every morning, those first few hundred metres were worrying, but after a while, I guess the body woke up and adapted. I’d been told by other people who’ve run in Ladakh, to expect a timing of about 30 minutes over and above one’s “usual” timing. So, realistically, I set myself a target of 2:45 and made it in 2:44, so was super pleased. The route for the half marathon was lovely, with amazing scenery, but the home straight was a killer. A 3.5km incline (upwards!!) and I am not ashamed to say that I walked almost the entire stretch. Along with every other runner in my sightline, I hasten to add. Basically, up until the 17/17.5km mark I felt I was actually doing quite well. I got a terrible stitch, but managed to work it out by taking deep breaths, and I think it was 2 hours as I passed the 18km mark, and I admit to feeling pretty pleased with myself. Then came The Slope, and my time got slower and slower, and (for the first time in the race) I actually stopped for a spilt second, and bent over, feeling drained. At least I’m still smiling, and I swear I hadn’t seen him or my sister Jane, both of them looking out for me. To smile when you are so bushed says something. Not quite sure what, but definitely something! The whole race was most definitely a unique experience. To run with snow-capped mountains as a backdrop is pretty special. To run through Choglamsar – where His Holiness the Dalai Lama has his summer home – and see a crowd of red-robed monks cheering and filming us on their mobiles – well, that is beyond special! I truly enjoyed the race, largely because there was no self-imposed time pressure. All I wanted to do was to finish the race. Truly. To finish it in good shape, having enjoyed it. Sounds about perfect! To many more! Your account of the marathon is superb, as real as it could be. Inspiring, motivating and too good.